Boy finds World War II plane and pilot in Denmark. 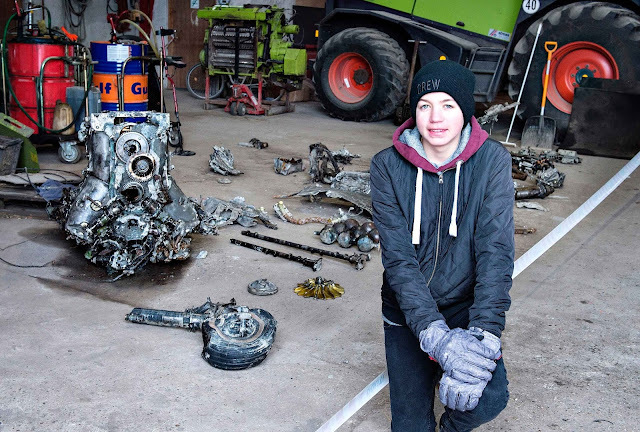 14-year-old Daniel Rom Kristiansen from Birkelse, Denmark's father shared a memory of a story his grandfather told him about his family making Christmas cookies in December 1944 when a World War II plane crashed on their farmland. Daniel's father still works on the land his father owned and even though he has been spending a significant time thoroughly working the fields, never in 40 years, neither his relatives who have worked on the land for decades seen any evidence to suspect a plane was still on the property. It was believed that the wreckage had been removed years before. Daniel decided he wanted to use his metal detector to search the field anyway, accompanied by his father. As he was scanning the field, a signal sounded and they uncovered some metal fragments, but realized they will need to dig much deeper and borrowed an excavator from a neighbor.